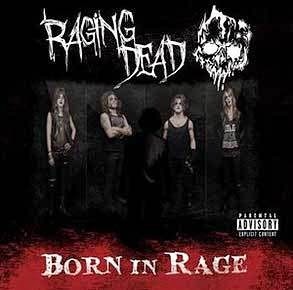 RockUnitedReviews: RAGING DEAD: "Born In Rage"
The horror, the horror! I recall spending way too many hours in my early teens to splatter-horror movies from Italy. The nights in front of the TV screen. Utterly sick and twisted... and so are these guys. Cloud Shade (vocals), Matt Void (guitars), Simon Nightmare (bass) and Tracii Decedence (drums), are trying to capture the images, make them come alive through their music and debut 6-track EP. They draw inspiration from the likes of Murderdolls, Wednesday 13, Misfits, Marilyn Manson, Rob Zombie, Skid Row?, etc. They've been causing mayhem and destruction live on stage with other horror-metal acts from Italy such as Superhorrorfuck and Scream Baby Scream. Opening track, "Scratch Me", the energy and driving force of Lordi vs. Superhorrorfuck. Lyrically speaking, the traditional dodgy stuff and killer lines such as and I quote, "the devil, he came out from the monster's cradle. rippin off my flesh and heart, he said he was giving me another chance", end quote. Flesh/off. Heart/out. Whatever. The suspicions of the more alert will have already been worried by the album cover (see pic right). Not to mention groovy titles such as "Awakening Of The Dead", "Nightstalker" or "Vengeance". The latter lifted off the punky songwriting style of Skid Row's Slave To The Grind for that matter. The songs are decent enough for a spin or two. But I believe they're still searching for their special horror theme. The shock effect? Clearly not as shocking in the era of Internet videos of bloodshed and murder. Isis is a Egyptian Goddess or a person-person who stutter-stutter. Not too shabby though, not too shabby at all.